From La Biennale di Venezia & OPEN to MACRO. Fourth stage for From La Biennale di Venezia & OPEN to MACRO. International Perspectives, conceived and curated by Paolo De Grandis and Claudio Crescentini, dedicated to the presentation in the MACRO areas of some international installations from the International Art Exhibition - La Biennale di Venezia and, on this occasion, the exhibition project has been extended to OPEN International Exhibition of Sculptures and Installations with the aim of enlarging the selection specifically to the sculpture and wide-ranging installations. OPEN, conceived by Paolo De Grandis in 1998, reaches this year its twentieth edition and is based on a consolidated and successful exhibition formula in which the artist-country combination, the outdoor spaces at Venice and the Venice Cinema Festival become an international platform of exchange and interaction on which to rethink and redefine the current status of art. Promoted by Rome Capital, Department for Cultural Growth - Capitoline Superintendency for the Cultural Heritage, and organised in collaboration with PDG Arte Communications, the project sees the convergence of art “perspectives” of two cities that work to enable international art experience to travel over the national territory. From the lagoon city to the Capital. Two cities linked by an impressive historic and artistic tradition that have succeeded in further enriching this experience to give a voice and life to contemporary art, to bring this resource to the forefront, making use of actions to document what exists, with promotions of events and international connections. Research launched by Paolo De Grandis in 1995 with the concept of external pavilions at the Venice Biennale and the presentation of new countries. On the occasion of this fourth stage it will be presented the exhibition Trajectory of Desire by Li Chevalier, French Chinese artist who debuted in the previous edition of OPEN. Li Chevalier pursues an aesthetic research where the aesthetic is the value of things and reveals the truth of the world. It is marked by elegance and refinement of technique and installation. When Li Chevalier leaves Beijing for Paris, her art arrives in a new dimension where Chinese tradition is nourished by an exquisitely western context that never absorbs it completely, but simply skims over it, making it more articulated. Another constant interest in Li Chevalier’s life is music, which she has cultivated since the age of 15. She sang as a soprano in the Chorus of the Paris Orchestra directed by Arthur Oldham and Semyon Bychkov. She has worked over the years with the soloists of Paris Opera, and collaborated with the China National Symphony Orchestra under the direction of Philippe Jordan to a landmark event at the State Opera of China where the violin solo Fréderic Laroque gave an impromptu performance in front of her installation. This passion for music gives her work a new expressive timbre. Among the most prominent exhibitions, Li Chevalier exhibited in major institutions such as the Royal Academy of Art London Summer Exhibition, the National Art Museum of China, the Shanghai Art Museum, the Today Art Museum, the National Library of China, The Sub-Marine Base Contemporary Art Centre Bordeaux France, the State Opera China. Li Chevalier does not like borders. Neither those of disciplines, nor of traditions or schools. Multiple interlinkages in disciplines, aesthetic languages, filiations and origins, give to her works a particular vocation: on a pictural and philosophical trail, she leads the viewer through mysterious encounters towards a deep reflection on our systems of thought beyond any attempt at artistic hegemony. Her aesthetic concept of beauty questions the links that shape our intercultural dialogues. "...Only beauty can generate desire and its quest..." says Francois Cheng. After 5 years of deep immersion in the Chinese Army’s operatic troupes as a singer, Li Chevalier discovers major European capitals, enthusiastically embracing the atmosphere of such mythical temples of art and knowledge as Sciences Po, Sorbonne University, various Florence and Venetian art institutions, London Central Saint Martins College of Art and Design, in quest of truth and beauty. Li Chevalier claims to be profoundly contemporary but passionately refuses the dictates of aesthetic nihilism. Her works have a primordial character. No true feeling can arise from confrontation to an art work without the prism of aesthetic emotion. According to François Cheng, "We could imagine a universe that would only be true, without the slightest idea of beauty touching it, it would be a universe only functional, or unfolded, uniform elements, which would move in an absolutely interchangeable way. Refer to an order of ‘robots’ and not to that of life”. 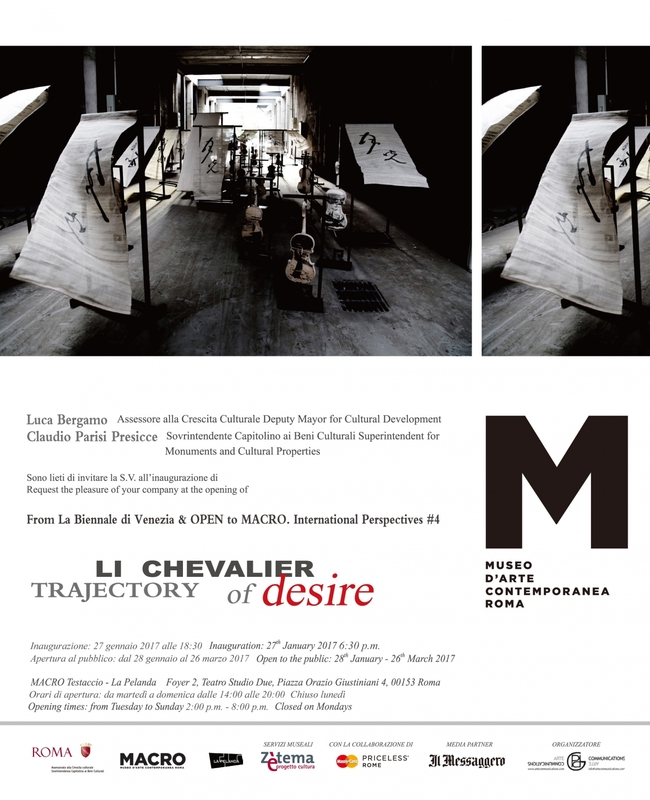 In the MACRO Li Chevalier presents “Polyphony” a monumental installation composed of violins and 30 experimental ink paintings. Li Chevalier works draw a trajectory with doubts and lightnings along the way, as her quest for beauty takes her to Rome, in her contemporary art journey. Polyphony refers to musical writing in several voices, each with its own dynamics. It is the convergence of several parallel melodies in a musical ensemble respecting the rules of harmony. Thus the vertical chaining of different chords enriches the overall composition. The installation of Li Chevalier, composed of various arts elements drawn from the East and the West, is a metaphoric image of our world that can no longer slow down its pace towards a "common" space, where nations and civilizations interact, a thousand stories and inheritances cross. It intends to pay tribute to the creative vitality born out of encounters, of tolerance, of all those values that make Europe, what the artist was able to discover, a fertile ground for expression and dialogue. Full rate: non-residents 11,00 €, residents 10,00 €. Reduced rate: non-residents 9.00 €, residents 8.00 €. Li Chevalier lives and works in her two art studios in Beijing and Paris. She graduated from Central St Martins College of Art & Design in London after she gained her first post graduate degree in Philosophy at Sorbonne University in Paris. Her first major exhibition was held at the National Museum of Fine Arts in China in 2010. Other solo shows followed, including Today Art Museum Beijing, the Museum of Fine Arts in Shanghai (2011), the State Opera in Beijing (2013), the Contemporary Art Center Submarine Base Bordeaux (2014). 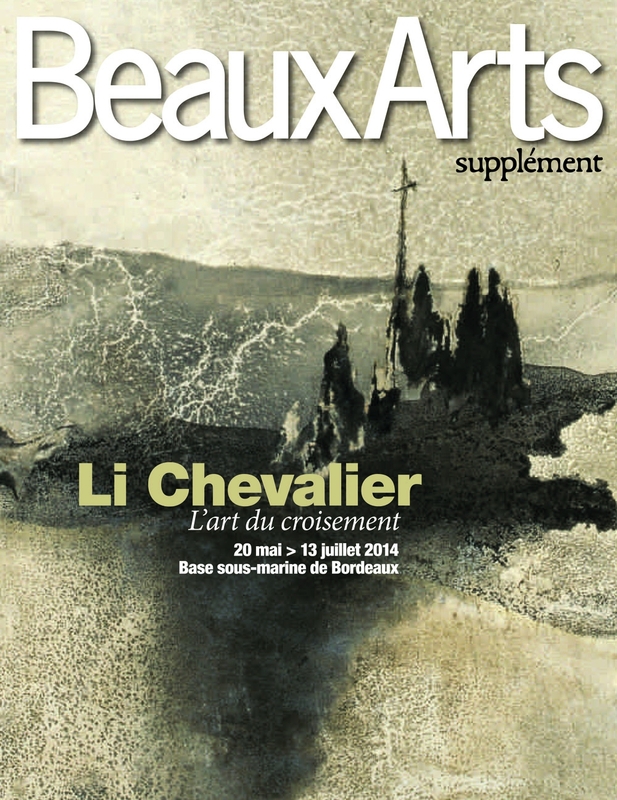 Li Chevalier’s works have been featured in numerous museums and international art fairs including the Royal Academy of Arts London , <Art Capital> at the Grand Palais [2006- 2009], Rodin Museum Beijing  Museum of Contemporary Art Shanghai Dolland, , Museum of Modern Art Beijing , Peking University , the National library of China  Museum of Today's Vision Beijing , Beijing International Fair , the National Museum of Wuhan , Sunshine Museum Beijing  Art Salon of the French National Fine Arts society at the Carrousel du Louvre , International Art Fair Glasgow , Northern Art Fair UK , International Art Fair in Shanghai , International Art Fair in London  National Gallery of Qatar Al Bida . Two of her major paintings have been part of the collection of the French Embassy in China since 2011 and are exhibited at the French Ambassador Residence, alongside works by two other Franco-Chinese artists Zao Wuki and Chu Tequn. Japan / Korea / Iran /Lebanon / Qatar / Morocco / Greece / Taiwan / Brazil / South Africa / Madagascar. Celeste Art prize shortlisted 2006 UK /. Mercury Art prize shortlisted 2006 UK/ Nominated prize Saint Martin international art salon 2003.
under the conduction of Philippe Jordan. 2014 Art Pavilion Joy Club Beijing [Praise mists] Jan.
2003 [The door] French Cultural Center Doha / Exhibition for the opening of the Cultural Center . 2002 Exhibition for "Qatar Happenings." Doha. 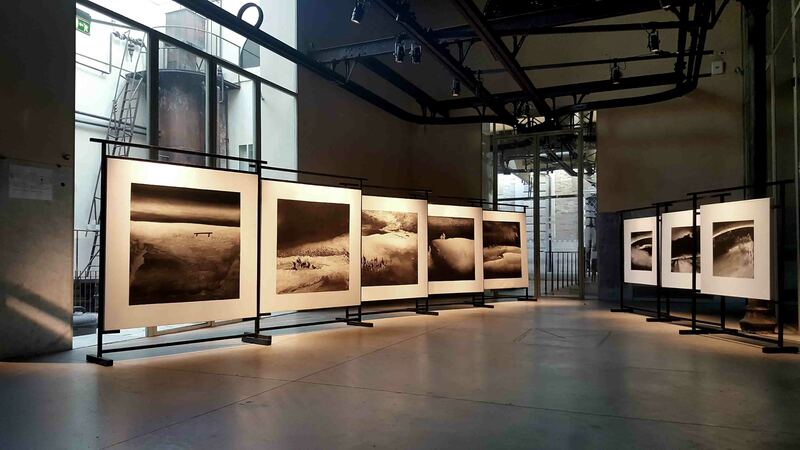 2014 Carrousel du Louvre Paris Art Salon SNBA Dec/< Harmonious and different > / People's University of Beijing "on top of the Yellow Mountain"
2013 Peking University "New Oriental spirit"
2012 Museum of Modern Art Beijing "Ink unstructured" / Museum of Fine Art Dolande Shanghai "Ink unstructured" Sep/. 4th Biennial ink painting, Taiwan October /"The New oriental spirit " Gallery Feng huang Ningbo Sept.
International Exhibition of Plastic Arts of Glasgow March / International Exhibition of Plastic Arts in London Feb.
2006 One four one Gallery London Dec.
2005 Qatar National Art Society art Salon - Doha Art Gallery Feb.
University School of the Arts USA Creative Art Centre, <women Artists in the Gulf>. Doha /Qatar National Art Society art Salon " National Gallery of Al Bida. "International Exhibition of Plastic Arts" Niort France / "artists Gulf" Gallery Bissan Gallery. Qatar. As a prelude to a concert by the China National Symphony Orchestra, conducted by Paris Opera chef Philippe Jordan, artist li Chevalier takes over the State Opera of China with a large scale installation composed of over 200 string instruments all dressed up with her trade mark ink painting, photography and calligraphy. Silk screen printed manuscripts of Mozart on rice paper are mounted on light boxes that light up her installation entitled [cantabile per archi ], work inspired by a piece from Latvian composer Peteris Vasks. Various cultural artifacts are combined gathered in a visual symphony expressing Li’s motto "respecting peculiarity combined into harmony”. Li Chevalier is a Chinese born artist who became French citizen in 1986. Working at the crossroads of Europe and Asia for the past two decades, Chevalier is most known for her "Euro-Asian" art language born out of blending western media and elements of eastern folk art. Her exhibitions are mostly distinguished by her own particular spatial composition and scenographic design. 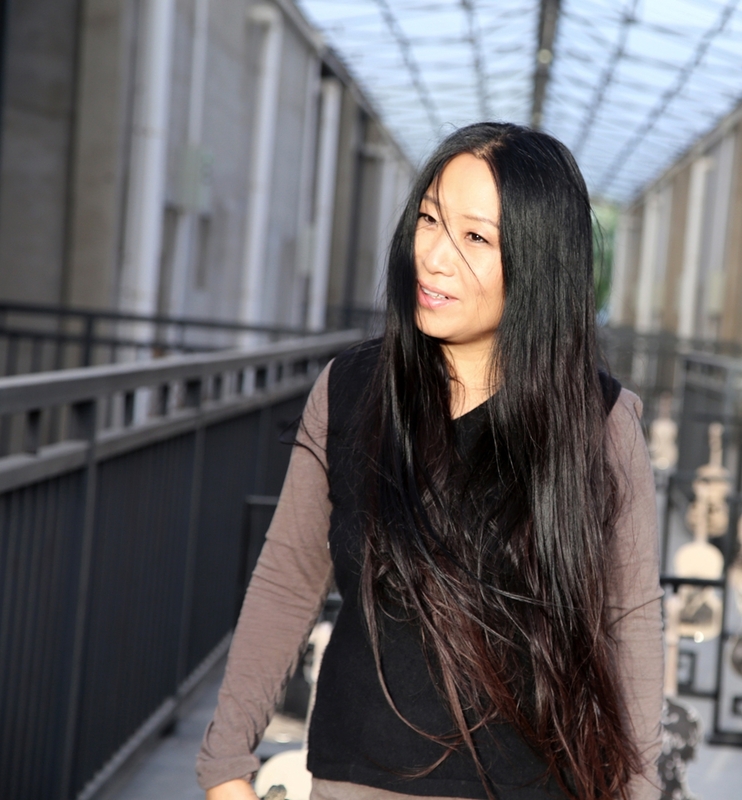 Alongside her professional practice as a visual artist, li chevalier having been a soprano in the Paris Orchestra’s Choir .She has been collaborating with Paris Opera musicians since 1991, staging many musical art events. Music has been one of the main recurrent themes in her visual art works. The painting entitled < I hear the water dreaming> exhibited at the Royal Academy of Arts in London in 2007, was a tribute to the Japanese composer Takemitzu. Her painting <Symphony of Destiny>, now part of the French Embassy in China art collection, pays homage to Beethoven. Other examples of her works related to music abound, such as < The rite of spring >by Stravinsky, [private collection in the US ], Transfigured Night, (Verklärte Nacht) by Arnold Schoenberg , or <Two voice invention> by Bach. In 2011, her major installation work displayed at Shanghai Art Museum was strongly inspired by Belgium composer Dirk Bosse's violin concerto: <Black , white and in between>.